After long years of neglect, Skype has reaffirmed its commitment towards Linux platform by announcing a brand new Skype client for Linux, and even goes on to release an Alpha version of the same which you can download and install right now. They come in DEB and RPM packages which must cover a vast variety of Linux platforms. A brand new Skype for Linux client was officially announced few hours ago. 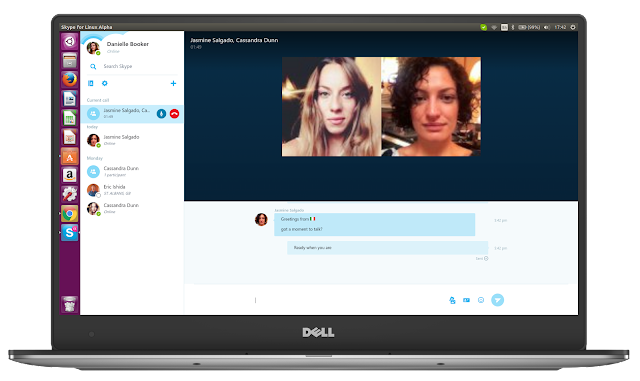 The new version of Skype for Linux is a brand new client using WebRTC, although, the just released Alpha version is not a fully functioning Skype client yet. In our experience, the new client definitely features a faster and more responsive Skype UI. Missing features will be added in the newer releases. Further information on Skype for Linux Alpha can be found here. And there's more! Anyone using a Chromebook or Chrome on Linux can now visit web.skype.com and make one-to-one and group voice calls on top of the messaging features they get today. This again is an alpha version of Skype based on WebRTC and inherits the same features of the Alpha version of the Skype for Linux client. Video calling and calls to landlines and mobiles are coming soon to Chrome browsers in Linux and Chromebooks. This looks like a a sea change in Skype's attitude towards Linux platform. A welcome change I must say. Following download options are available right now. Do share your thoughts.